With the Gallardo Superleggera, launched at the 2007 Geneva Motor Show earlier this month, Automobili Lamborghini presented an uncompromisingly high-performance sports car. Thanks to increased power and a 100 kg reduction in weight, the new range-leading Gallardo Superleggera is even more dynamic than the already very exciting Gallardo. The weight/power ratio of the Lamborghini Gallardo Superleggera is only 2.5 kg/hp, putting it in the top lightweights of its class. The Superleggera also has the fastest acceleration in its class. It needs only 3.8 seconds to go from 0 to 100 km/h (0-62 mph); 0.2 seconds less than the basic model. The Lamborghini Gallardo Superleggera is an extremely high-performance car: it includes a standard robotised mechanical e-gear gearbox that guarantees shifting without removing hands from the steering wheel. Production volumes will be restricted to lower numbers than the standard Gallardo. 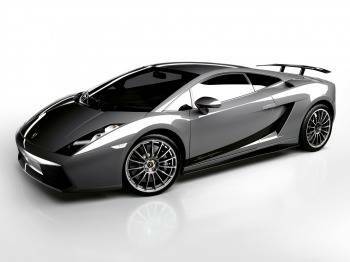 The Lamborghini Gallardo Superleggera’s engine is the latest version of Lamborghini’s well-known 4,961 cm3 V10. Now 530 hp is reached in 8,000 min-1. The increase in power was made possible by the engine’s improved volumetric efficiency through reduced intake load losses and by exhaust backpressures, together with optimised electronic control. Naturally, emission levels observe the strict EURO 4 and LEV II standards. Lamborghini engineers decreased the Lamborghini Gallardo’s already low weight when empty (1,430 kg) by another 100 kg (70 kg in the USA) using advanced materials and technologies. The engine cover is made of visible carbon fibre and transparent polycarbonate, a type of material that guarantees lightness and also shows off the magnificent V10. The rear diffuser and underbody covering, the rearview mirrors, door panels and the central tunnel’s covering are also made of carbon fibre. Further reductions in weight were achieved by replacing certain glass surfaces with transparent polycarbonate. For the interior, monocoque carbon fibre sports seats covered in Alcantara® were chosen to ensure restraint of the driver and passenger during the intense lateral accelerations that the Gallardo Superleggera is capable of achieving around curves. A comprehensive specification and extensive range of options will be available, with some exclusive to the Superleggera. The Lamborghini Gallardo Superleggera comes with robotised mechanical e-gear as standard; a sports package including shock absorbers; and special suede-covered steering wheel. The car is available in four colors: Midas Yellow, Borealis Orange, Telesto Gray and Noctis Black. Pirelli P Zero Corsa tyres (standard) on new Scorpius forged rims accentuate the Lamborghini Gallardo Superleggera. A few of the options that can be requested include the multimedia system with navigator and CD-changer; a rear video camera to make parking easier (with optional rear wing only); a Carbon accessories kit for the interior; a fixed rear spoiler; a four-point seatbelt (not for USA); tubular rear frame or fitting points for later inclusion (not for USA, Japan or Middle East); and carbon-ceramic brakes.